Black / Bronze tinted Ostrich Leg foot. 3 piece decorative vamp. Vamp Stitching pattern adds flexibility and flair. 13 inch top. Leather outsole on an all leather upper. Glove lining. Medium Round toe (R toe) shown. Several toe styles available. Slightly underslung walking heel. Handcrafted. Brushed Vintage Goat shaft of soft dress leather. Fancy tug straps and deep scallop. Hand made exotic boots. Fancy Collar & pulls. 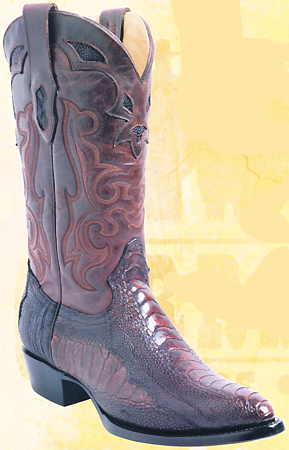 Multiple rows of Western boot stitching on shaft.